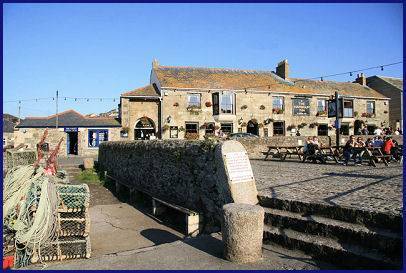 The atmospheric and picturesque Cornish fishing village of Porthleven overlooks Mounts Bay and offers the tourist a wide range of interesting galleries and shops offering local arts and crafts. There are also a variety of cafes, restaurants and inns and a wide range of accommodation to suit all budgets. The name derives from the old Cornish words Porth - meaning harbour, and leven - which means smooth or even. The harbour once consisted of flat marshland on the banks of a stream which flowed into the sea from the small cove. The harbour has a characterful old granite pier from which basking sharks can occasionally be sighted. The harbour was constructed in 1825 and faces the prevailing wind to make it easier for sailors seeking refuge to reach a safe haven in times of stormy weather around the perilous Lizard Peninsula. Fishermen have been plying their trade from Porthleven since the fourteenth century and today commercial fishing boats still sail from the village, catching mainly crab, lobster and crayfish. The two cannon which stand on either side of the harbour were once fired on the Napoleon's navy during the battle of Brest, they come from the frigate HMS Anson, which was wrecked on nearby Loe Bar in 1807. The three mile sand and shingle beach at Porthleven stretches to Loe Bar and the small fishing cove of Gunwalloe on the Lizard Peninsula. The beach is normally safe for swimming, there are lifeguards in season and a red flag system is in operation. Dogs are banned from the beach in the summer months. Due to the powerful swells Porthleven has acquired the reputaion of being one of the most highly regarded surfing spots in the UK, with waves which regularly exceed two metres. The Bickford-Smith Institute, situated next to the pier and harbour entrance, with its seventy feet high tower, is something of a local landmark. It has the appearance of a church but currently serves as the local snooker club as well as housing the local government offices. The Wreck and Rescue Centre dates from 1893 and began life as a china clay store where up to 7,000 tons of china clay from the Tregonning Hill quarries were stored awaiting export. Situated near the Ship Inn is the old lifeboat house, which dates to 1894. 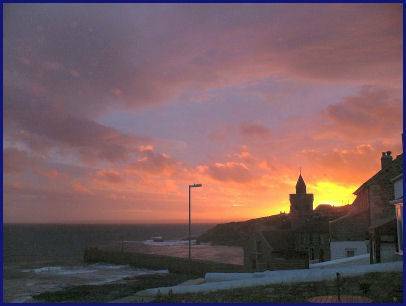 In former times Porthleven had its own lifeboat service which operated from 1863 to 1929, the service ran 28 missions and saved 50 lives. The community still retains strong links with the RNLI and an annual Lifeboat Day is held each August. The South West Coast Path passes the village providing some excellent scenic walks, it may be followed to east to the Lizard Peninsula or to the west to the impressive cliff-edge tin mines of Rinsey. A walk to the nearby market town of Helston passes Loe Bar, a large shingle bank separating the sea which is the largest freshwater lake in Cornwall, which local legend states to be the lake into which Sir Bedevere cast King Arthur's sword Excalibur after the fateful battle of Camlann.